As originally posted through HSU Now, Humboldt State students can help take safety into their own hands with the new Rave Guardian app, a free piece of software that enables a smartphone to boost personal safety. The app, which can be downloaded from the Apple or Google Play stores, lets users send automatic alerts to friends and family in case of an emergency, report anonymous tips, call 911, and more. When a user creates a free account, he or she is automatically added to the Humboldt State network, making it simple to access the app's features. By downloading Rave Guardian on an Android or iOS device, users can invite friends and family to join their networks as "Guardians". First, download and set-up an account. Users can add their name, campus address, medical notes and other pertinent information in case of emergency. Secondly, begin adding contacts to join your "Guardian network". Invite family, friends, or others to be your "Guardian", and communicate with them within the app as needed. Be sure to turn Location Services on for the Rave Guardian app, to ensure that access to your GPS location is available to University Police and/or your "Guardian(s)" when your call is made. Direct immediate connection to University Police with GPS location and personal profile information. 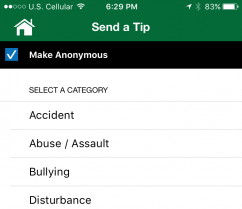 Enables anonymous crime tip reporting through text and images within seconds. Important note: If you want your tip to remain anonymous, you must ensure the check box is clicked, as shown in the below picture. Otherwise, if you would like your location to be known to the HSU Police Department, be sure to uncheck the box. This is for tips only and must be checked every time if you want it to remain anonymous. Students can identify University Police, friends, roommates, and family as "Guardians" when setting their Rave Guardian Safety Timer. During a timer session, "Guardians" and University Police can check the status of the student. If the Safety Timer is not deactivated before it expires, University Police are automatically provided with the user's Rave Guardian profile to proactively identify and check-in on the individual. Other "Guardians" will also have access to important details such as his/her phone's location on a map and contact information. The app also allows for easy emergency communication. In an emergency situation, one button in the app directly connects the user to University Police dispatch or 911. Student-created Safety Profiles contain information such as residence details and medical conditions. When a student requires assistance - on or off-campus - student Safety Profiles are displayed to University Police and Smart911 enabled 911 centers nationwide. It is important to know that when an incident arises that affects the entire campus, information will be posted to HSU's home page. In addition, the campus community can receive emergency alerts via text messages by entering a cell phone number into HSU Alert in myHumboldt.